To stay fit, challenge myself and manage day to day stress. 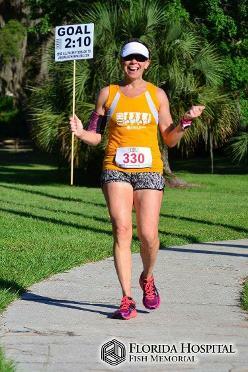 Space Coast Marathon 2011 - my fist BQ, I won 3rd in my age group and 1st place for Space Coast Runners. I received my awards from Kathrine Switzer, the first woman who ever ran Boston. I truly enjoy it. Helping someone achieve a goal is better than any race award I could ever win. 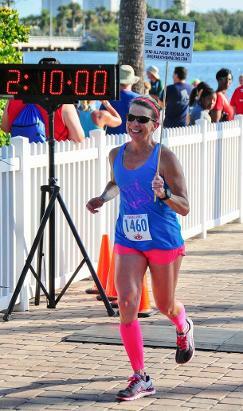 I paced a 2:00 half marathon group and had a couple people run their first sub 2:00 half. It was incredible! We will have fun! I am very high energy and motivational, stick with me and you will achieve your goal! Be realistic about the pace you can run and if you err, do so on caution. It is best to start slow than to go out too fast, you can always pull ahead. Don’t get so focused on pace that you miss the experience, especially in a big city marathon. I volunteer with the NASA Outreach Program judging local science fairs.